Objectives The aim of this survey was to investigate parental vaccination attitudes and responses to vaccine-related media messages from political and medical leaders. Design This was a cross-sectional study using a semiquantitative questionnaire. Data were analysed using descriptive statistics, X2 tests and logistic regression. Setting Data were collected from a web-based questionnaire distributed in Australia by a market research company in May of 2017. Participants 411 participants with at least one child under 5 were included in this study. The sample was designed to be representative of Australia in terms of gender and state of residence. Primary and secondary outcome measures The primary outcome measures were parental attitudes towards childhood immunisation before and after viewing vaccine-related messages from political and medical leaders, including Donald Trump (USA), Pauline Hanson (Australia) and Michael Gannon (Australia). Parents were classified as having ‘susceptible’ (not fixed) or ‘fixed’ (positive or negative) views towards vaccination based on a series of questions. Results Parents with fixed vaccination views constituted 23.8% (n=98) of the total sample; 21.7% (n=89) were pro-vaccination and 2.2% (n=9) were anti-vaccination. The remaining 76.2% of participants were classified as having susceptible views towards vaccination. Susceptible parents were more likely to report a change in their willingness to vaccinate after watching vaccine-related messages compared with fixed-view parents, regardless of whether the messaging was positive or negative (Trump OR 2.54, 95% CI (1.29 to 5.00); Hanson OR 2.64, 95% CI (1.26 to 5.52); Gannon OR 2.64, 95% CI (1.26 to 5.52)). Susceptible parents were more likely than fixed-view parents to report increased vaccine hesitancy after viewing negative vaccine messages (Trump OR 2.14, 95% CI (1.11 to 4.14), Hanson OR 2.34, 95% CI (1.21 to 4.50)). Conclusions The findings suggest that most parents including the vaccinating majorty are susceptible to vaccine messaging from political and medical leaders. Categorising parents as ‘fixed-view’ or ‘susceptible’ can be a useful strategy for designing and implementing future vaccine promotion interventions. This study used a novel method of classifying parents as having either ‘fixed’ or ‘susceptible’ views towards vaccination, rather than ‘acceptance’ and ‘refusal’. The study sample was representative of Australia in terms of gender, state residence and country of birth. Data on participants’ socioeconomic status were not collected and the survey was only administered in English, so there may be some degree of bias. Proportion of fixed antivaccine parents was too small to determine conclusions about the impact of media messages. Vaccines are one of the greatest successes in public health1 but have been questioned by prominent antivaccination celebrities in the media2 3 contributing to vaccine-related controversy and parental vaccine hesitancy. The added voice of political leaders in the media such as US President Donald Trump4 and Australian Senator Pauline Hanson5 may have additional influence on parents, but have not been studied. Public figures ranging from media, sports and political celebrities have used their fame to direct media attention towards a diverse range of health issues including cancer screening and treatment, HIV disclosure, drug addiction, multiple sclerosis and Alzheimer’s disease,6–12 reducing stigma and increasing awareness. Over a quarter of parents indicated trust in vaccine-related information from celebrities according to a US study.13 Most celebrities are not formally qualified or trained to deliver health communication and their personal experiences can be misrepresented when broadcasted on a population level.12 Some celebrities even actively condemn childhood vaccination, such as former model Jenny McCarthy.2 3 Television host Katie Couric, an established bowel cancer screening spokesperson,11 portrayed doubts14 about the safety of Human Papillomavirus Vaccine on her talk show. US President Trump’s call for a commission into vaccine safety in early 2017 led by vaccine sceptics Robert Kennedy Jr and Robert De Niro has concerned health professionals around the world.18 In Australia, Senator Pauline Hanson created controversy in March 2017 when she advised parents to disregard the advice of their doctors and ‘do their own research’ into vaccine safety and promoted a non-existent ‘vaccination reaction test’ which she subsequently retracted.5 When such views are made public, they are often countered by medical experts, yet there is little research on the impact of political messages and how best to ensure optimal public health messaging. Parental vaccine hesitancy is well studied, and generally defined as a delay in acceptance or refusal of vaccination despite availability of vaccination services.19 This definition encompasses parents with a spectrum of vaccine-hesitant opinions, including those with fixed antivaccination views, who generally do not change their opinions, and uncertain parents that are not fully compliant with vaccine schedules but could be persuaded to change.20 While WHO SAGE definition21 refers to parents who are fully or mostly compliant with vaccine schedules but experience caution or uncertainty in doing so, the emphasis of research and health intervention is rather focused on those who refuse some or all vaccines. These vaccinating parents nevertheless may be influenced to doubt childhood vaccination and delay or refuse vaccinations in the future and may still be susceptible to negative vaccine messages.22 While health promotion and intervention tend to focus on parents at the hesitant end of the spectrum, it is currently unknown how easily influenced the silent majority of vaccinating parents are, whose continued compliance is necessary for upholding effective vaccination coverage rates. Hesitant but compliant parents in Australia are influenced by vaccine-related events and news coverage, contributing to complex unresolved concerns regarding the safety of vaccines, and could potentially reduce their future compliance accordingly.23 The aim of this survey was to investigate parental vaccination attitudes and responses to vaccine-related media messages from political and medical leaders of all types of parents through an alternate model of classifying parental vaccine opinions by susceptibility to change rather than their behaviour of vaccine refusal. This study was designed to measure parental attitudes at baseline and following viewing of vaccine messaging from public figures through a 15–20 min online questionnaire of parents of children aged 0–5 years in Australia. The questions used in the online survey were formulated by the authors of this paper to answer the research questions of this paper and to obtain a range of qualitative and quantitative data on parental attitudes towards childhood vaccinations and sociodemographic information. Short video clips and corresponding transcripts of vaccine messages from US President Donald Trump, Australian Senator Pauline Hanson and head of the Australian Medical Association Michael Gannon were then shown to participants and responses collected. The first two messages (Trump, Hanson) questioned vaccine safety, whereas the last message (Gannon) affirmed vaccine safety (for transcripts, see online supplementary appendix 1). The impact of these messages on parental willingness to vaccinate and perception of vaccine safety was compared against baseline views. A market research company Survey Sampling International was employed to randomly distribute the survey link to representative sample (see table 1) aged 18–60 years stratified by gender and state/territory of residence from a database of registered panel members (n=400 000). Distribution of points redeemable for gift cards, cash out or charity donation provided incentive. A total of 1727 potential participants clicked on the survey link. A total of 1316 of these participants had no children or only had children over 5 years of age and were ineligible; 411 parents comprised the final eligible sample. Assuming 50% support for vaccination, 385 participants were required to see the difference, with alpha=0.05 and power of 80%. The study aimed to recruit 400 participants, with sampling designed to be proportionate to the population of states and territories in Australia. Parents were then categorised according to the fixedness of their baseline vaccination views either for or against into ‘fixed-view’ and ‘susceptible’ groups, the rationale being that vaccine attitudes lie on a spectrum25 between complete baseline vaccine rejection and vaccine acceptance, which we defined as fixed anti-vaccination and pro-vaccination views (see figure 1). We defined ‘susceptible parents’ by excluding those who expressed fixed vaccination views in the baseline questions, including parents who expressed hesitancy or concerns towards vaccines. The remaining parents who did not have firmly fixed views, even if they were fully vaccinating, we defined as ‘susceptible’. Parents were categorised as fixed pro-vaccine or anti-vaccine based on their views of childhood vaccination as ‘very important for children’ or ‘not important for children/risky for children’, respectively, and these views not changing during the survey. The data from the quantitative survey were then internally validated by checking against qualitative comments, in particular, the use of strong language like ‘never’ or ‘always’, and ensuring these were consistent with the categorisation of fixed or susceptible by the agreement two study authors (EJZ and AAC). Spectrum of parental vaccination attitudes. The influence of messaging from the selected public figures on susceptible parents was determined by comparing their views at baseline with views after being exposed to the messaging. The analysis first noted positive and negative change in willingness to vaccinate. Subsequently, change in either direction was combined into one single variable ‘change’ and unchanged positive or negative pre-existing attitudes into a ‘no change’ variable for further analysis. Closed-ended questions were asked if the media messages presented in this survey increased vaccine safety concerns, with optional open-ended elaboration. The difference in response between the subgroups was evaluated using p values from bivariate X2 analysis and OR. Qualitative analysis was also performed by manually collating optional open-ended responses regarding the persuasiveness of the public figures. Parents were not involved in the design of this study. Table 1 summarises the demographic characteristics of the participants, compared against data from the Australian Bureau of Statistics.26 27 The majority of participants were aged 25–44 years old (n=314, 76.4%). The percentage of parents born overseas (n=89, 21.7%) in the sample is slightly less than the population proportion of 28.5%. The majority of surveyed parents (n=327, 79.6%) had completed some form of tertiary education. Most parents (88.6%) selected doctors as strong influencers of their vaccination attitudes, and 20.2% of parents were strongly influenced by the media and/or Internet websites (figure 2). Strong influences on parental vaccination attitudes (n=411). Parents with fixed vaccination views constituted 23.8% (n=98/411) of the total sample − 89/411 were pro-vaccination and 9/411 were anti-vaccination. The remaining 313 parents (76.2%) were defined as susceptible. There were no significant differences between fixed-view and susceptible parents with regard to the demographic characteristics of gender (p=0.544), age (p=0.299), country of birth (p=0.827) and education (p=0.247). For every public figure, the majority of parents (Trump 78.8%; Hanson 81.8%; Gannon 81.8%) did not change their pre-existing vaccine willingness to vaccinate in either direction regardless of whether their baseline views were positive or negative (table 2). Of the parents who changed their willingness to vaccinate, susceptible parents were approximately 2.5 times more likely to change compared with fixed view parents (Trump OR 2.54, 95% CI 1.29 to 5.00, Hanson OR 2.64, 95% CI 1.26 to 5.52, Gannon OR 2.64, 95% CI 1.26 to 5.52). Negative vaccine views from Trump (OR 2.14, 95% CI 1.11 to 4.14) and Hanson (OR 2.34, 95% CI 1.21 to 4.50) were significantly more likely to affect the susceptible subgroup (n=313) to increase their perception of vaccine risk. Positive vaccine portrayal from Gannon (OR 1.63, 95% CI 0.79 to 3.36) was not significantly more likely to change vaccine risk perception in susceptible parents (n=313) as opposed to fixed view parents (n=98). The net impacts of the public media messages on parental willingness to vaccinate between the three public figures were proportionally relatively similar, regardless if they had presented a positive or negative message (figure 3). Trump’s negative message impacted 67 parents in total to increase their willingness to vaccinate and 20 to decrease willingness to vaccinate. Similarly, Hanson’s message also increased the willingness of 54 parents to vaccinate. The vaccine-supportive message from Michael Gannon, a health professional directly refuting Hanson conversely impacted 58 parents to vaccinate and 17 parents to become less willing to vaccinate. Breakdown of subgroups by parental change in willingness to vaccinate postexposure to media messages. The majority of all parents (n=256; 62.5%) chose Gannon as the most persuasive public figure, and 37.7% (n=155) of parents considered Hanson or Trump’s negative vaccination messages most persuasive (table 3). Qualitative analysis of open-ended survey questions identified several key themes that emerged regarding the media figure in terms of their credibility, delivery style and standpoint; vaccine safety concerns and ‘moderation’ of vaccine schedules; as well as parental rights. Parents with fixed positive or negative views also had strong opinions about the credibility and trustworthiness of the public figures. 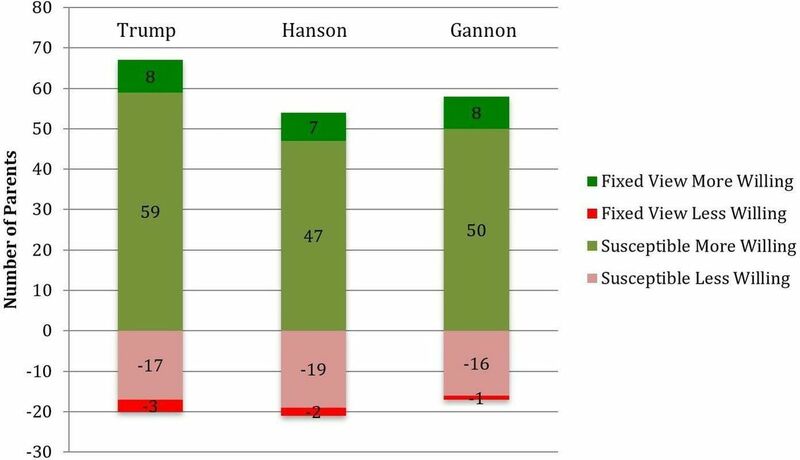 Parents with provaccination stances were more likely to view Gannon as the most persuasive and Trump or Hanson as the least persuasive. Common reasons cited include trusting in the scientific background of health professionals and distrust of the scientific understanding and political agendas of the politicians. One parent’s statement ‘(Gannon) actually knows what he is talking about…’ demonstrated trust in the scientific background of the medical leader. In some cases the medical professional was most persuasive ‘Only because I feel Donald Trump and Pauline Hanson are driven by political agendas’, demonstrating strong mistrust in underlying political agendas. One pro-vaccination parent’s statement was ‘I agree with all of them in a certain way, but vaccinations prevent childhood sickness point blank’. In contrast, ‘fixed’ anti-vaccination parents identified more strongly with themes of vaccine hesitancy, with one parent stating ‘(Hanson) seems to be the only one telling people to think and research instead of blindly following the masses’. Parents defined as ‘susceptible’ commonly expressed varied and less polarised reactions, with some expressing that they ‘can’t decide really’. While several ‘susceptible’ parents had trust in the medical qualifications and professional background of Gannon, some found arguments by Hannon and Trump persuasive because ‘(Hannon) speaks with views of parents in mind’ and ‘smaller doses over a period of time sounds like a good idea’, respectively. The delivery of the vaccine messages also impacted their persuasiveness. One parent valued Trump’s anecdotal style message because he ‘had the most personal example’, in contrast Gannon’s message which another parent described as ‘a poor effort to educate people about vaccination. Feels more like an authoritarian figure saying just to do it because we tell you to and we may take some action against you…’. Furthermore, another parent stated Hanson ‘is a mum and raised valid concerns that would cross people’s minds…’ suggesting that Hanson’s vaccine message and her standpoint as a woman and mother appeals to vaccination concerns already existing in the community. Parents who stated Hanson as most persuasive cited her rights-based argument as their reasoning. Although Hanson suggested parents should conduct independent vaccine research and suggested a non-existent vaccine reaction test, one parent felt Hanson gave ‘Quite a logical speech as people (have the) right to know every single detail about vaccination’, demonstrating the persuasiveness of her suggestion that the existing body of literature supporting vaccinations is insufficient for parents to make a complete decision. The role that celebrities and public figures, especially politicians play in health communication, must be adequately understood to improve the effectiveness of vaccination programmes. Concerns about vaccination expressed by public figure in a seat of power, like President Trump or Senator Hanson may be more difficult to address and can influence a large group of parents who do not hold fixed views on vaccination due to their authority as elected officials with influence on health legislation. More targeted terminology needs to define vaccine accepting parents with potentially changeable views towards vaccination, who could be the focus of vaccination education and promotion interventions.28 Parental vaccine attitudes are often categorised by a scale19 of vaccine acceptance, with absolute uptake of all vaccines on one end and absolute refusal of vaccines on the other. Through the subanalysis of ‘fixed-view’ and ‘susceptible’ parents, this study used alternative terminology to directly identify the group of interest—vaccine accepting parents who are ‘susceptible’ to influence by negative vaccine messages from public figures. This group is also a worthy target of health promotion and public health messaging about vaccination. This study determined that only a minority (23.8%) of parents have fixed views on vaccination in either direction, and those who do not hold fixed views may be influenced by public figures. Moreover, the proportion of parents with fixed antivaccination views was very low (2.2%, n=9/411), consistent with the documented rate of Australia children with registered conscientious objections in 2016 prior to its abolishment later that year.29 This population of fixed-antivaccine parents is too small to draw any conclusions on the effects of media messaging on their vaccine opinions and behaviours, a limitation that could be addressed in future research. Furthermore, the analysis in this paper did not identify distinguishing demographic predictors of the ‘susceptible’ group, future studies should attempt to characterise this group further. They may be an invisible majority who are not the focus of vaccination promotion messages, which tends to be aimed at parents at the negative end of the spectrum of attitudes. As we have identified this group to be subject to the influence of public figure in positions of authority, it is critical to better understand this group across different sociopolitical contexts. The qualitative analysis identified similar themes and concerns to common antivaccination arguments identified in multiple studies,3 23 31 32 suggesting that concerns about issues like vaccine safety, vaccine scheduling and parental autonomy need to be better addressed. Hanson may have resonated with some parents because she is a mother. Furthermore, parental preference for media message delivery style demonstrated a high level of variability ranging from factual to anecdotal. Parental responses suggest the mechanism of influence by public figure in health communication is affected by complex factors of pre-existing biases and opinions both towards vaccination and the public figure in question. This is corroborated by a recent US study33 that identifies the influence of sociopolitical ideologies on vaccination trust and attitudes. As a result, a key takeaway of this paper is that most parents do not hold fixed views either for or against vaccination, even if they vaccinate their children. We have shown that this group is more likely to be influenced by antivaccination messaging from public figures than people with fixed views. In fact, parents with initially positive but not fixed views towards vaccination can be swayed towards mistrusting childhood immunisation by negative media messaging from public figures of authority. We analysed change in parental vaccine attitude irrespective of direction of change, to confirm that parental vaccination attitudes are subject to influence from media messaging. Observation of the absolute numbers of parents who increased or decreased in willingness to vaccinate in response to specific media messages (figure 3) also reveals an apparent paradoxical response of some parents whereby they increased willingness to vaccinate in response to an antivaccinating message and vice versa. This apparent ‘backfire’ response possibly indicates a discord between what public figures communicate and what the public actually perceives. In this study, it appeared there were strong political opinions existing alongside or potentially causing variable vaccination opinions, and some Australian parents may have rejected the messages of Trump or Hanson based on their pre-existing political ideals. Parental rejection of provaccine or antivaccine messages could be motivated by ‘cultural cognition’34 whereby individuals attempt to selectively value perspectives that conform their pre-existing perceptions of vaccine risk. Future research could explore more deeply the factors that impact direction and magnitude of change resulting from media messaging in a variety of contexts. The role of Michael Gannon in counteracting vaccine misinformation in the mass media is mirrored in other countries by other medical leaders like Paul Offit’s role in the US media3 countering public antivaccination sentiments. Medical spokespeople have great potential to counter antivaccination sentiments in public forums. Additionally, other politicians may counter the antivaccination sentiments publicly, such as Barack Obama’s public response38 to the 2015 multistate US outbreak of measles, and the bipartisan refutal of Hansons’ antivaccination comments by Australian prime minister Malcolm Turnbull and opposition leader Bill Shorten.39 In our study, Gannon’s provaccination message did not make parents more hesitant about vaccine safety, indicating that there is no significant backfire effect from provaccine messaging on these parents. For parents with fixed views, positive vaccine messages can backfire, causing vaccine-hesitant parents to entrench their views, and conversely, antivaccination messages can strengthen the views of vaccine-supporting parents, confirmed by our study. Furthermore, many parents have strong personal opinions regarding childhood vaccinations and vaccination attitudes may be linked to the expression of broader political and social views. It appears that political polarisation plays a role in influencing vaccination attitudes and behaviours in some parents. Vaccine hesitancy research has focused on parents at one end of the spectrum, with negative vaccination views. We have shown that even vaccine-accepting parents with positive views can be influenced negatively by public figures in positions of authority. Health communication should be designed to target parents without fixed views, even if they vaccinate their children. We suggest a different lens through which to view parents and plan vaccination messaging, as ‘fixed view’ and ‘susceptible’, respectively. Politicians and public figures can influence parents’ views of vaccination and are in a unique position of also being able to directly influence health policy. They, therefore, have a responsibility to provide carefully informed health information. Politicians play a crucial role in upholding community confidence in public health policies including childhood vaccination.
. Who’s afraid of Jenny McCarthy?Time2010;175:40-5.
. Transcript: Read the Full Text of the Second Republican Debate. 2015http://time.com/4037239/second-republican-debate-transcript-cnn/.
. In: Cassidy B, ed. Pauline Hanson joins Insiders: ABC Insiders: Australian Broadcasting Company, 2017.
. Impact of news of celebrity illness on breast cancer screening: Kylie Minogue’s breast cancer diagnosis. Med J Aust2005;183:247–50.
. Katie Couric backs off from her anti-vaccine show-but not enough. Los Angeles Times2013.
. Blair silent over Leo’s MMR jab. The Telegraph2001.
. Tony Blair should have gone public over Leo’s MMR jab, says Sir Liam Donaldson. The Guardian2013.
. Vaccine skeptic Robert Kennedy Jr. says Trump asked him to lead commission on ‘vaccine safety’. The Washington Post2017. SAGE Working Group. Report of the SAGE working group on vaccine hesitancy: WHO, 2014. IBM Corp. IBM SPSS Statistics for Windows Version 24.0. Armonk, NY: IBM Corp, 2016. Statistics ABo. Australian Demographic Statistics. Canberra: Commonwealth of Australia, 2017:36–8.
. Obesity in adults: Overview of management: UpToDate. 2017https://www.uptodate.com/contents/obesity-in-adults-overview-of-management?search=obesity&source=search_result&selectedTitle=2~150&usage_type=default&display_rank=2. Immunise Australia Program. ACIR- National Vaccine Objection (Conscientious Objection) Data. 2016http://www.immunise.health.gov.au/internet/immunise/publishing.nsf/Content/acir-cons-object-hist.htm.
. Parental attitudes, beliefs, behaviours and concerns towards childhood vaccinations in Australia: A national online survey. Aust Fam Physician2017;46:145–51. Parliament of the Commonwealth of Australia. Social Services Legislation Amendment (No Jab, No Pay) Bill Canberra. 2015http://www.aph.gov.au/Parliamentary_Business/Bills_Legislation/Bills_Search_Results/Result?bId=r5540.
. Obama to parents doubting ‘indisputable’ science: ‘Get your kids vaccinated’. The Washington Post2015.
. Hanson refuses to back down from vaccination comments as furore rises. SBS News2017. Contributors We confirm that the manuscript has been read and approved by all named authors and that there are no other persons who satisfied the criteria for authorship but are not listed. We further confirm that the order of authors listed in the manuscript has been approved by all of us. We confirm that we have given due consideration to the protection of intellectual property associated with this work and that there are no impediments to publication, including the timing of publication, with respect to intellectual property. In so doing we confirm that we have followed the regulations of our institutions concerning intellectual property. EJZ contributed to conception and design of the study, overseeing the whole study, data management and writing the first draft of manuscript report; AAC and AH contributed to statistical analysis and manuscript writing; CRM was responsible for conception and design of the study, survey design, data analysis and manuscript writing; All authors reviewed the final draft of manuscript. Funding This study was supported by the NHMRC Centre for Research Excellence, Integrated Systems for Epidemic Response (ISER). Ethics approval The University of New South Wales ethics committee approved (approval number: HC17045) the survey instrument and study protocol prior to data collection.